Happy tax day to everyone. I took these photos while working on our taxes, but I don’t see any signs of anti-tax fervor. I did first type out ‘Blom Day’ for the title, in true tea party style, but overall the gardens seems quite free of financial angst. 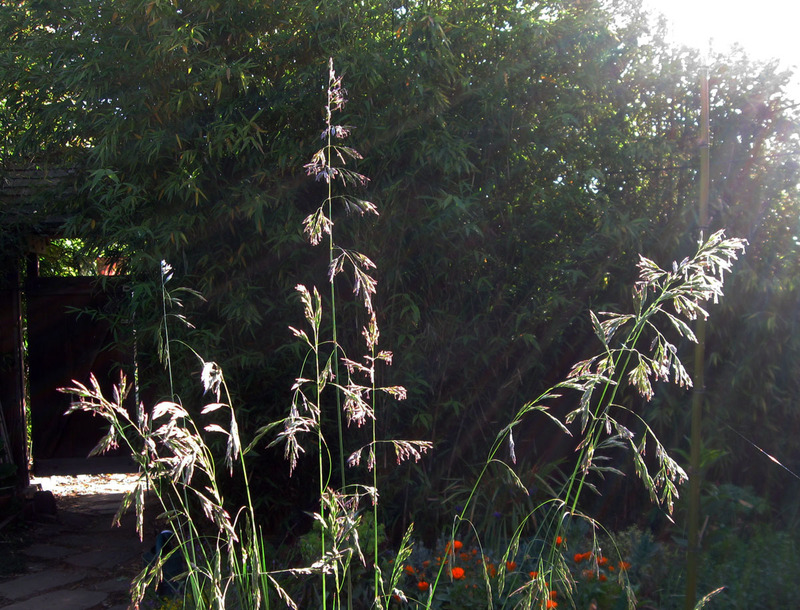 Except for spittle bugs on some of the plants, the garden seems quite happy. 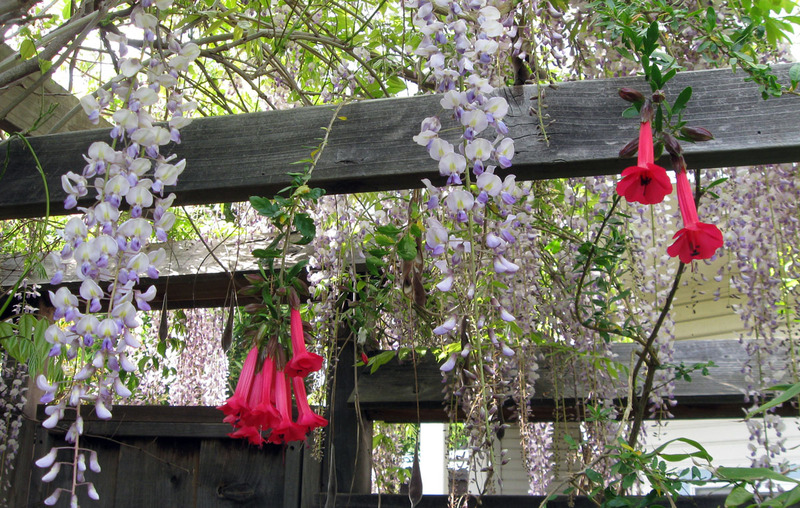 The wisteria shower is the highlight of the garden, with probably the meadowfoam (Limnanthes douglasii) the next best. We have four patches of it in our garden, with the sunnier patches in full bloom now and the shadier patches just starting up. I really like it. It does great in any spot where we’ve improved the soil with some compost. Though it has a reputation for liking water, it has never needed any extra, probably a sign that our garden is naturally somewhat damp. The Geranium “Bill Wallis” didn’t work its way into the mass of meadowfoam quite as well as I’d hoped, but some of the flowers are together. 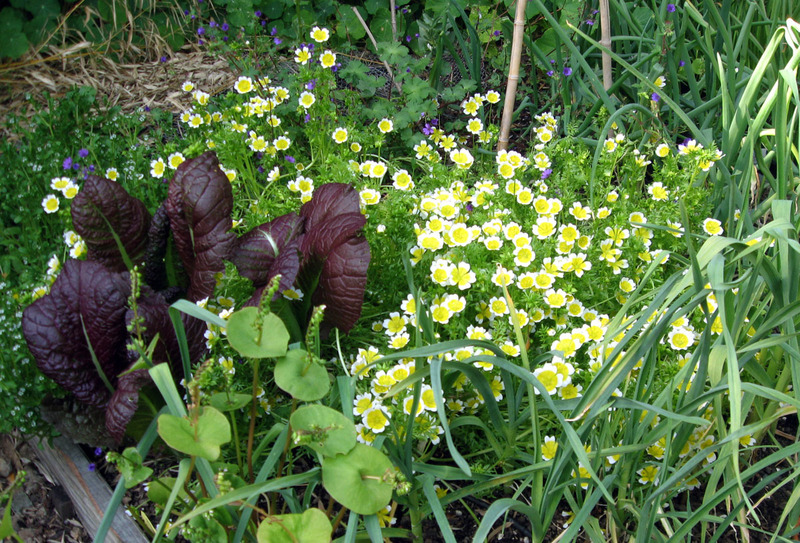 This is the third year for this patch in the vegi garden. The meadowfoam seems to finish at just the right time for planting a tomato or zucchini, and then it comes back on its own as the summer crop is ending. The Triteleias have started. It seems clever that they open the flowers down at ground level, before raising them up to where you can see them. 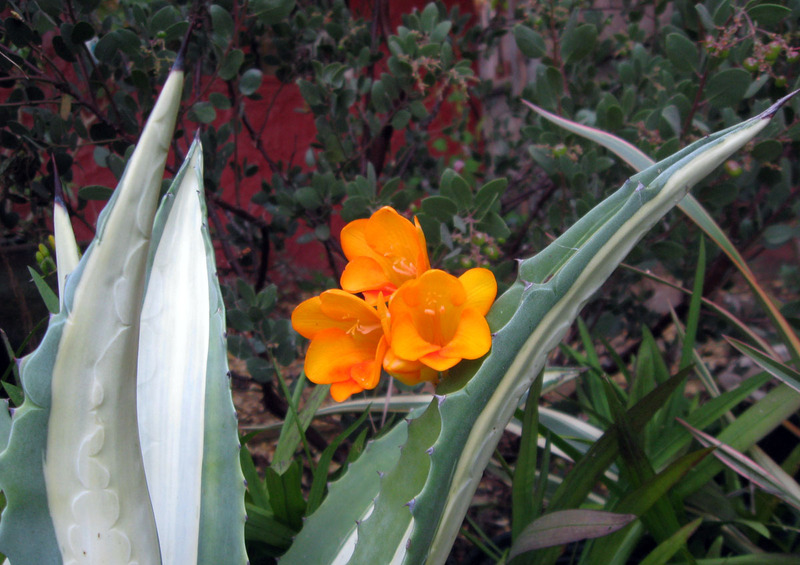 The Sacred Flower of the Incas is blooming. A couple of branches made it up into the wisteria. I’m not sure if I would call the Sacred Flower a vine, but I wouldn’t really call it a shrub either. 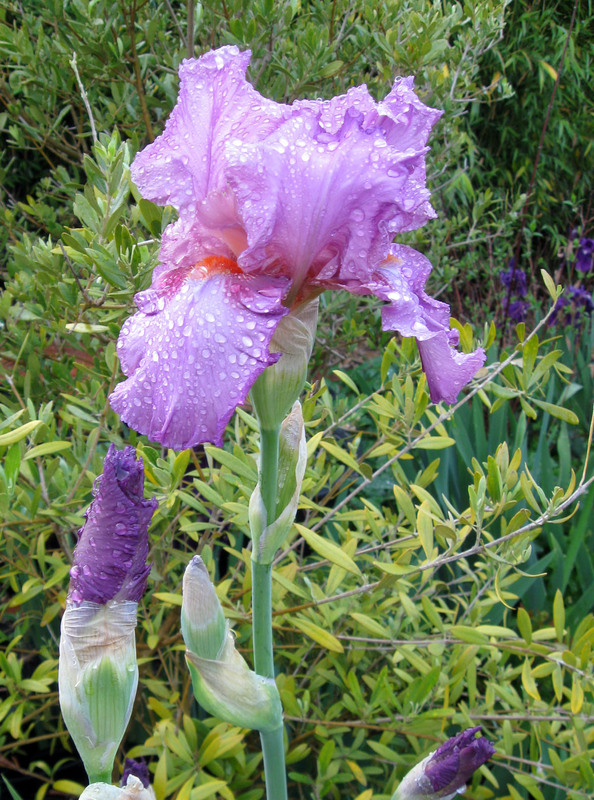 We brought home some bearded iris divisions three years ago and stuck them in the garden without knowing what color they’d be. When we don’t like the color we move them to my mom’s house. We’ll see about his one. We’ve had a few mystery freesias for a couple of years, too. 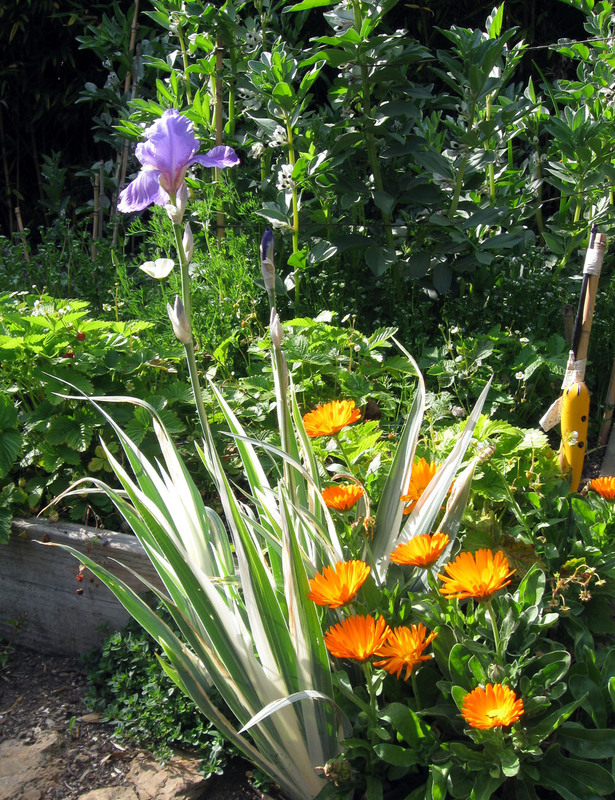 The orange turns out to match the poppies and calendulas in our inner yard, so these can stay. 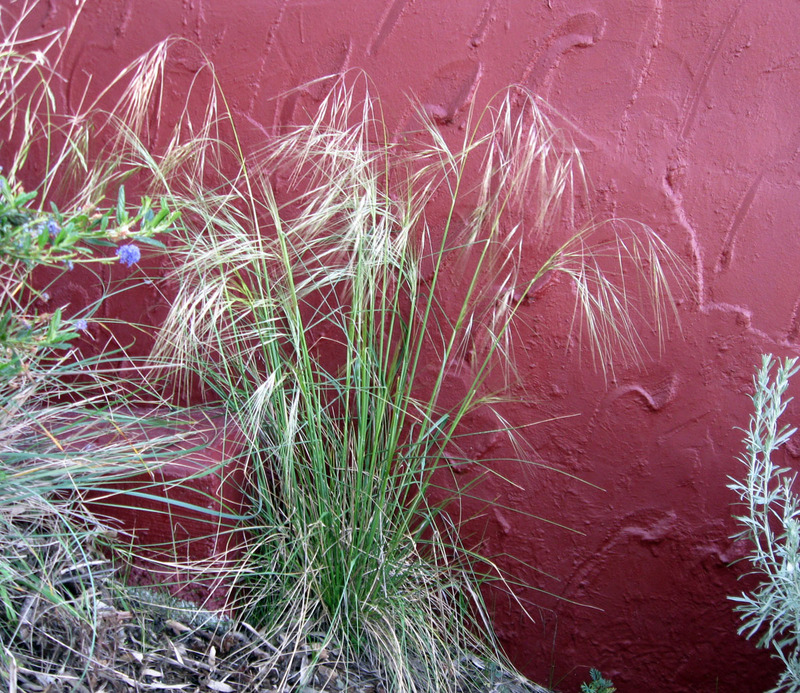 And the bunchgrasses are blooming. I sometimes forget to think of them as flowering plants. Thanks to Carol at MayDreamsGardens for hosting Bloom Day. Click over to her blog for links to a ton of other bloggers showing what is blooming in their gardens. 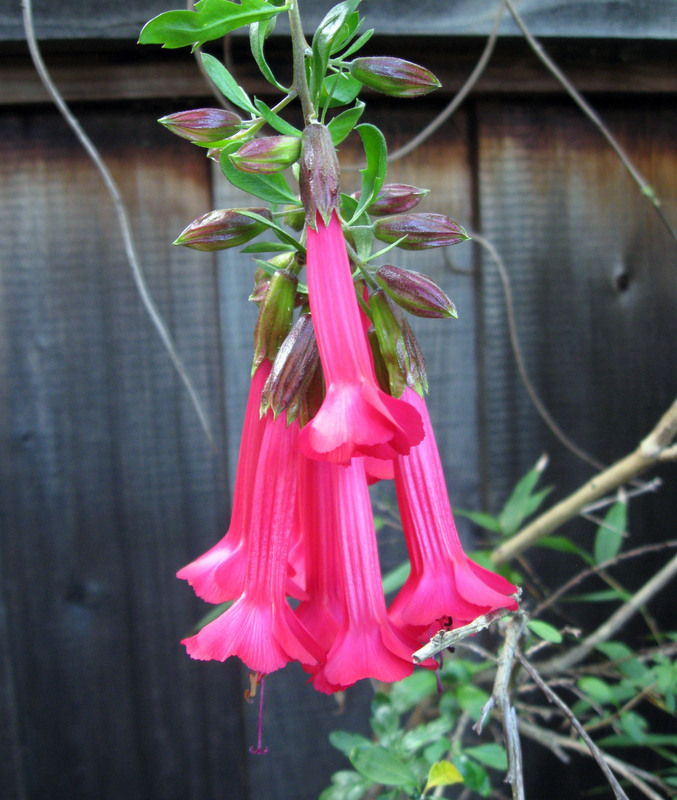 The full list of what is blooming in my garden and a few more photos are below. Several plants opened their first flower during the day today. We have had a single ‘White Linen’ Cal Poppy in the vegi garden for three years now. 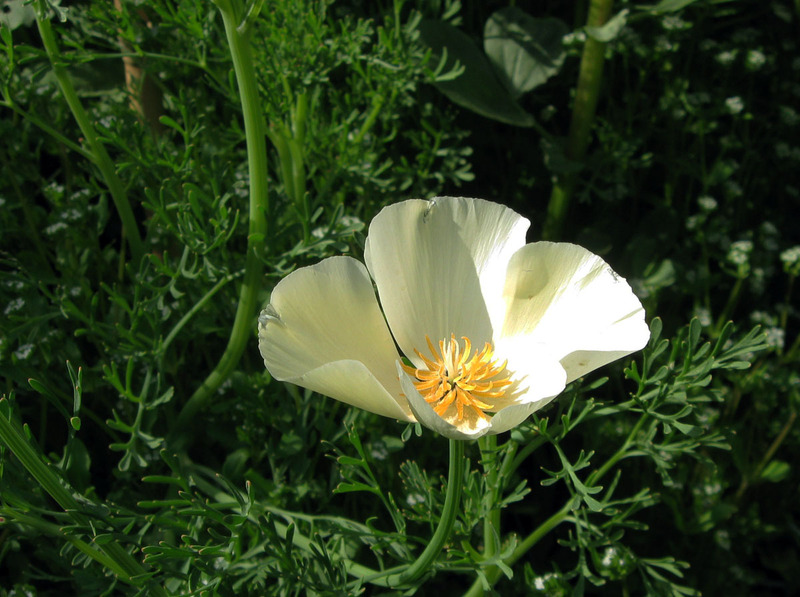 If you had asked me if the world needed a whiteish California Poppy, I would have said no, and I would have been wrong. They’re really nice. This entry was posted on Thursday, April 15th, 2010 at 7:08 am and is filed under garden bloom day, plants. You can follow any responses to this entry through the RSS 2.0 feed. You can leave a response, or trackback from your own site. You have beautiful meadowfoam! I’ve been meaning to buy some of that myself. Ryan, the Sacred Flower of the Incas is gorgeous. The meadowfoam and mustard combo is quite striking! 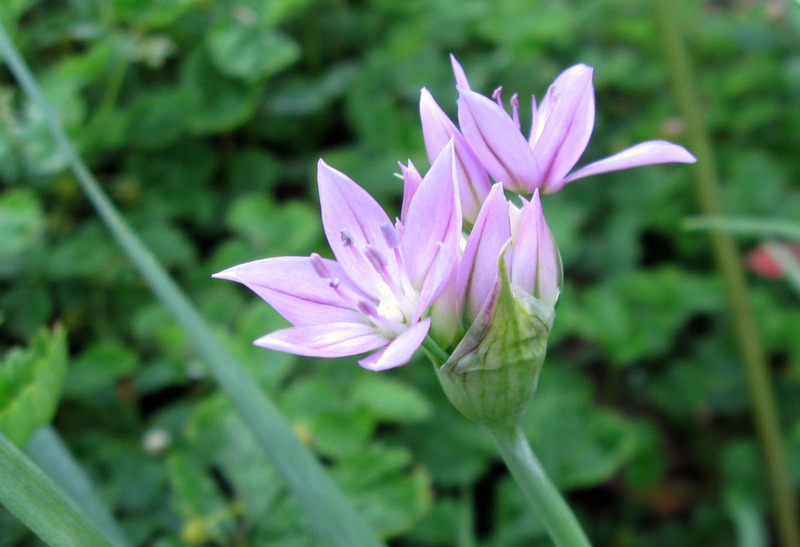 One of my customers has Triteleia ixiodes everywhere in there yard and several yards nearby. Must seed pretty freely. Great photos, enjoyed them very much. Gayle, I think meadowfoam would do well in your yard. Keewee, agreed, Sacred Flower sure knows how to bloom. Katie, I think so, too. I like the ornamental with the edible. 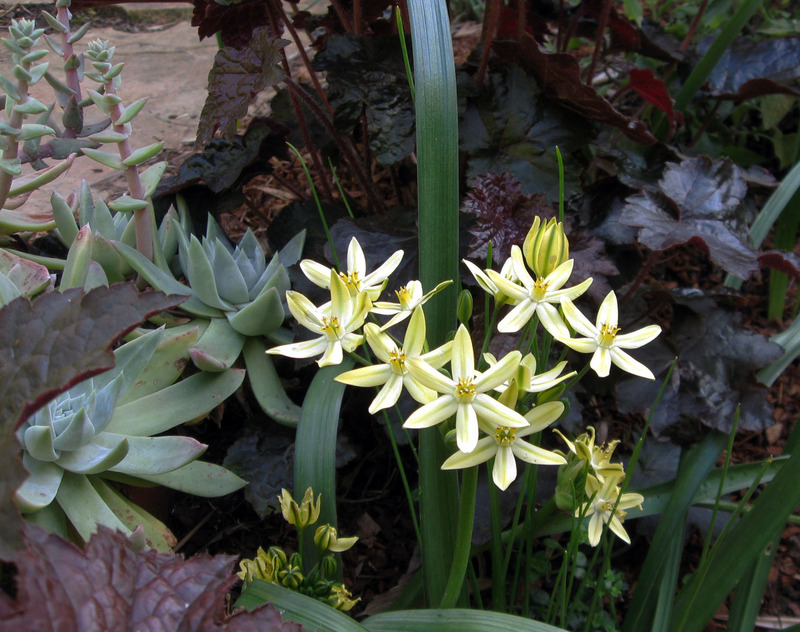 Randy, I haven’t yet seen the Triteleia reseed, but I’ve seen the Brodeias reseed. Hard to imagine them becoming a problem around here, but they have been really easy to grow, so it wouldn’t be a complete surprise. Thanks, your photos are much better than mine. I’ll second the love for the friendly soft yellow meadowfoam with the more architectural edibles. It’s a calming little tableau, but still with lots of interesting things going on. The White Linen poppy also looks like another soft, easy color to work with. I’m coming to really appreciate how well that soft ivory plays with other colors. I’ve seen White Linen look good with the Baby Blue Eyes you have so much of and which I don’t’ seem able to grow. I don’t usually like Alba varieties, but this one has a nice ivory color like you say. 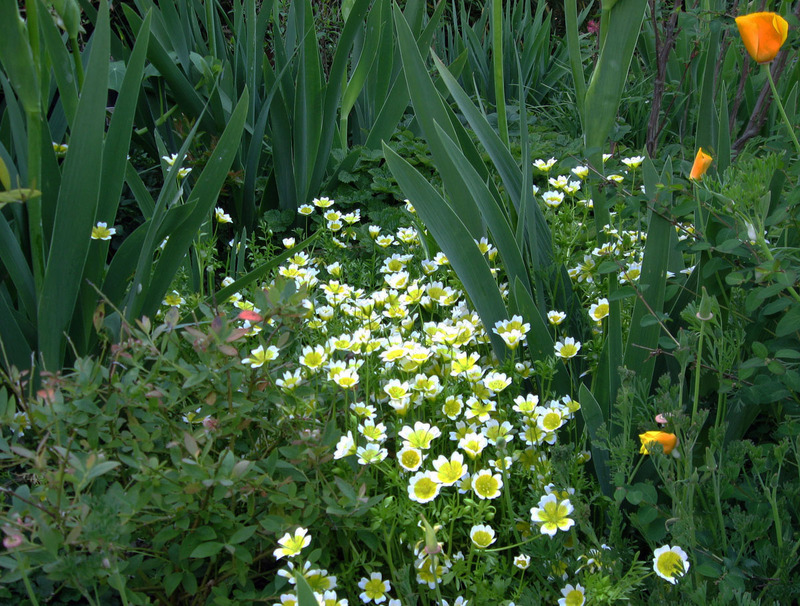 I like the little trail of meadowfoam, inviting us deeper into the garden. Nice pairing of bloom colors. 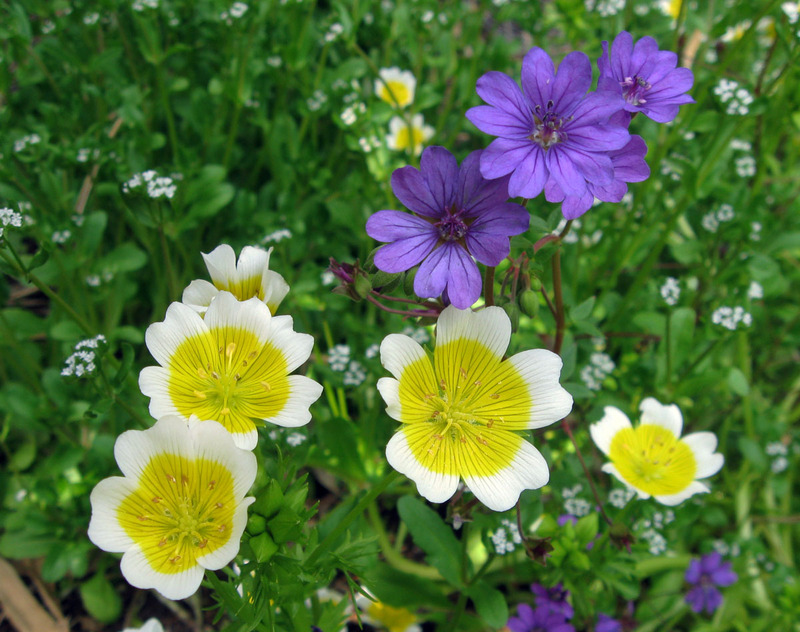 And great photos of the triteleia, allium and white poppy. I had one as well. They are really cool.